Bennington was chartered in 1749. The Town is governed by a Select Board, with a Town Manager heading daily operations. You will find Bennington a friendly place to live and work. 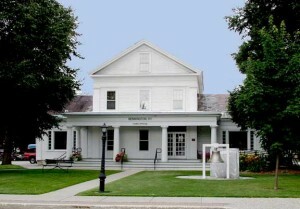 The Town Office is located at 205 South Street in historic Downtown Bennington. Bennington Permitting, Planning, and Code Enforcement Office: Building and zoning permits, Planning Commission, Development Review Board, Code Enforcement, building and zoning regulations, etc. Permits: Municipal permit applications, Building, Zoning, Sign, Subdivision, Access, Vendors, Demolition, etc. Bennington Town Clerk’s Office: Voter Registration, ballots, Election Information, Property Transfers, Births, Vital Records, Dog License search. Historic Preservation Commission: Planning and advocating for the protection and appreciation of Bennington’s historic and architecturally significant resources. Contact Information: Phone and email information for Town Offices, as well as a listing of Select Board Members, State and Federal representative. Services: Information for the Fire, Rescue, Police, Public Works, Recreation Center, Senior Center, Transfer Station and more. You will find contact information as well as hours of operation. Documents and Forms: Current and recent minutes of meetings of the Select Board and other Bennington public meetings. You will find also links to the annual Town Report and Water Assessment Reports. Grand List: The Town of Bennington Vermont’s Assessor’s Office brings you a searchable database where you can look up grand list values. Demographics: Population and income information of the Bennington Community.